Increasingly, builders are having to address indoor air quality along with energy efficiency. Some in the industry are leading the way. BILL HAYWARD DIDN'T FEEL GOOD. He was irritable, fatigued and had trouble focusing. His family wasn’t right either: his wife suffered constant sinus infections, and their young children were getting one cold after another. They had moved into their Central California home one year before. When first looking at the house, Hayward had noticed a “damp cement” odor downstairs. But a little over a year later, after the kids had fallen ill once again, the family’s doctor told them they needed to move out: their home was sick, and it was making its occupants sick, too. Though leaving the house was difficult, the family’s health began to improve almost immediately. Hayward began an in-depth investigation of high-performance building systems. “I started hearing stories of people who live in Passive Houses who said they threw away their inhalers after moving in,” he says. These homes typically weren’t just energy efficient, but also held high standards for non-toxic materials. Hayward learned that unsealed basements and crawlspaces are common sources for pollutants and allergens, and that nearly half of the air inside a home can be pulled up from those areas. He consulted experts, including Carl Grimes and Joe Lstiburek, and created a special department to research and analyze how homes were built, with the goal of developing a non-prescriptive, goal-based methodology for creating healthier buildings. “We wanted it to be easy for builders to understand and implement,” says Hayward. Continuous fresh air. Install a balanced mechanical system that filters incoming air, distributes it throughout the house and ejects stale air and moisture. Insulation and air sealing. Install adequate insulation to keep temperatures from fluctuating. Combine this with proper and thorough air sealing to keep moisture from penetrating cavities in the roof and walls. Sealing crawl spaces is essential, so that contaminants are not pulled into the house from exposed damp soil. Non-toxic materials. Reduce or eliminate materials and products that emit potentially harmful chemicals, both during and after construction. Cleanable surfaces. Eliminate carpets and other materials which harbor allergens and pollutants, or clean them regularly and properly. Bedding should also be cleaned regularly. In 2013, the Indoor Environment Division of the U.S. EPA released a report called Moisture Control Guidance for Building Design, Construction and Maintenance. In an early section on the health effects of moisture, the guide cited studies by the Lawrence Berkeley National Laboratory and the EPA, which built on recommendations from a special committee of experts, including representatives from the Centers for Disease Control and Prevention (CDC). “This was a game changer,” says Hayward. “The language changed from, ‘When a building gets wet, sometimes people get sick, but only those with compromised immune systems and the elderly’ to ‘When buildings get moist, people get sick, period.’” In Hayward’s view, the EPA also placed the burden of responsibility for a building’s health squarely on the shoulders of builders—even if it had been poorly designed. With that in mind, Hayward has created several tools for builders, including resources within Hayward lumber that can help them optimize buildings for health. A special website helps builders and architects communicate with clients, which includes video testimonials and easy-to-understand information comparing healthy and “sick” homes. Every material in the Hayward family’s new home was carefully researched and documented. 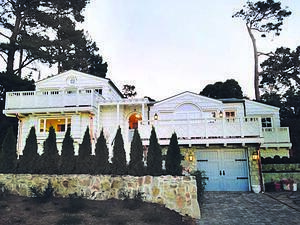 Hayward decided to go a step further and build a living example of a healthy home for his family in Carmel, California. Over 2,000 hours went into researching and vetting every single material, and led to the development of the Hayward Healthy Home Permitted Products List. (The idea is similar to products and materials that have been vetted for the Living Building Challenge’s Red List.) Hayward now provides the list to his customer base. Some materials proved challenging; for instance, no good substitute exists for pressure-treated wood, which did not make the Permitted Products List. Hayward relates stories of builders who claim they can’t be onsite when pressure-treated lumber is delivered, as too much exposure has sensitized them to the point where they feel ill just being around it. Hayward’s solution was to encapsulate the lumber with non-toxic paint. He believes this treatment, combined with proper air-sealing and ventilation, is an acceptable solution for basements. During construction, Hayward noticed his processing and speech became affected when he entered enclosed spaces, such as the mechanical room. He believes the culprit was construction dust. “Construction dust holds the history of the house,” he says. He installed air scrubbers while the house was being built; before moving in he used leaf blowers to dislodge dust from every surface, then cleaned them with vacuums equipped with HEPA filters. Once the house was finished, Hayward closed it up for 24 hours before initiating a week of indoor air quality testing. “The tests revealed the presence of chemicals that would not have been predicted by the MSDS,” says Hayward. Concentrations went down once the HRV was switched on. He plans to re-test after 90 days. Thanks to active intervention, the Haywards’ children are recovering from the physical and neurological impacts of living in a sick house. Bill Hayward describes himself as “more sensitive” now. In another part of the country, a Chicago-based builder is taking responsibility for indoor environments. Evolutionary Home Builders (formerly Weiss Building & Development) specializes in Passive Houses and can boast some impressive accomplishments, including Chicago’s first certified Passive House and the first Department of Energy Challenge Home in Illinois. “I’ve always been interested in health, and I knew I was going to be a builder,” says founder Brandon Weiss, a third-generation builder. He played professional basketball in Europe before starting his company, which exposed him to progressive green building techniques, including Passive House projects. A case study comparing two buildings in Portland, Oregon—one healthy, one “sick”—further piqued his interest in building science. He was drawn to Passive House because it’s a performance-driven certification based on building science. In particular, Passive Houses demonstrate how energy-efficient, air-tight buildings combined with precise mechanical ventilation and non-toxic materials can create excellent indoor air quality. 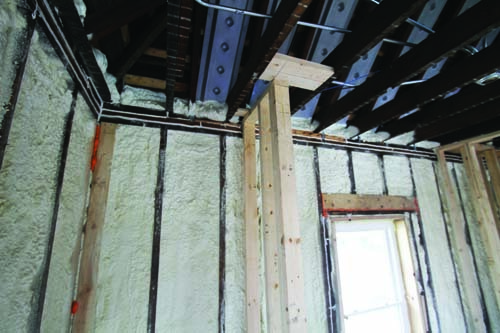 Walls in an EHB home achieve high R-values and minimize thermal bridging. For Weiss, indoor air quality starts with building a super-efficient envelope, which includes advanced framing and minimal thermal bridging. R-values for walls typically reach R-40, with one-third of the R-value represented by continuous exterior insulation. “The exterior insulation functions as an air barrier and reduces condensation,” says Weiss. 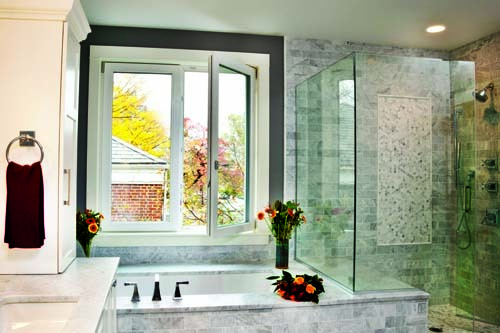 To complete the envelope, he prefers European windows for the quality of their hardware and energy performance. Even if the home is not to be an officially certified Passive House, EHB aims for the standard of 0.6 air changes per hour (ACH). An energy recovery ventilator (ERV) or heat recovery ventilator (HRV) controls the cycling of air. “With an ERV, air is completely balanced, and it’s twice filtered,” says Weiss. The units work in tandem with HVAC equipment to achieve both superior energy efficiency and indoor air quality. For example, the Adaptation Home, a Zero Energy Ready Home built in Oak Park, Illinois, features a Zehnder 550 ERV and Daikin ducted mini-splits. It has also earned EPA Indoor airPlus certification.
. Windows from European manufacturer Zola help EHB achieve superior envelopes; careful attention to detail during installation ensures the envelope keeps performing over the years. Evolutionary Home Builders (EHB) always takes care to use non-toxic materials, going beyond low- or low-VOC paints and adhesives. Weiss is currently involved in a Living Building Challenge project, which is poised to be the first new residence in the area to be certified under the rigorous program. The Challenge requires that every material be vetted for compliance with the Red List; materials and products cannot contain any of 14 “worst-in-class” chemicals and compounds, including PVC and formaldehyde. But procuring information about materials isn’t always easy. “We have to get disclosures from the manufacturers,” says Weiss. “It’s been an eye-opening experience.” He believes that the Declare program, an initiative set forth by the International Living Future Institute, which houses the Living Building Challenge, will make veting materials easier for designers and builders, while at the same time urging manufacturers toward greater transparency. Weiss’ company conducts thermal imaging and blower door tests to ensure tight envelopes. In addition, EHB backs up its health claims with indoor air quality testing and their workmanship with a 15-year warranty. The third-party IAQ testing occurs just prior to occupancy and includes total VOCs, formaldehyde and particulates. Though this is standard practice for EHB, Weiss notes that the latest version of LEED awards a point for such testing, pointing to a greater emphasis on IAQ in the industry. The 15-year “building science” warranty guarantees against any compromise in the envelope or structure—leaky windows, for instance. Circuit-by-circuit energy monitoring helps raise awareness of energy consumption, and also provides feedback that something might not be working properly. Carbon monoxide, temperature and relative humidity sensors are also installed throughout the home. Finally, EHB walks clients through the project after completion and provides them with a Homeowner’s Manual. “If they don’t know how to maintain the home, it won’t function as well as it could,” says Weiss.